As a one-stop shop for musicians around the world, Guitar Center wanted to reach particular audience segments with its Search campaigns. Customer Match helped the brand optimize its ad spend based on specific product categories while boosting clicks and conversions along the way. Since its start as an electric organ shop in 1959, Guitar Center has continually advanced its business to offer nearly every instrument, tool, and technology that musicians need to pursue their passion. As the brand evolved to meet the needs of consumers in the digital era, its mission remains the same: to connect musicians with the unique joy that comes from playing an instrument. While making purchases in-store and online, customers can sign up for Guitar Center's email newsletter for exclusive access to special offers, sales, events, and new product launches. The brand wanted to go beyond email to re-engage with these shoppers and was looking for a way to amplify the power of its search campaigns. To help reach these high-value shoppers and improve the brand's ROAS, Customer Match (CM) hit just the right note. CM enables a brand like Guitar Center to reach shoppers it already has a relationship with, showing them more relevant ads across Search, YouTube, and Gmail. With the help of Adlucent, its digital marketing agency, Guitar Center segmented its list of users into specific audiences. These audiences were grouped by product category based on what they purchased, like drums, guitars, and tech (which includes equipment for electronic music and DJs, an audience the brand especially wanted to reach). Within each category, the brand segmented customers into high- and low-value audiences based on purchase history. Because Customer Match has no expiration date on its customer email lists, Guitar Center used it to re-engage with dormant shoppers any time they search for new products online. Guitar Center could then bid more effectively on keywords for each audience, especially for those high-value shoppers who are more likely to click and make another purchase. "Customer Match is an ideal way to deliver the right message to the right audiences, and it's helping us drive greater lifetime value from our customer base," said Robert Spears, director of digital marketing at Guitar Center. "We have been able to use what we’ve learned about our customers' behavior and apply that to deliver a more personalized ad experience for our customers." 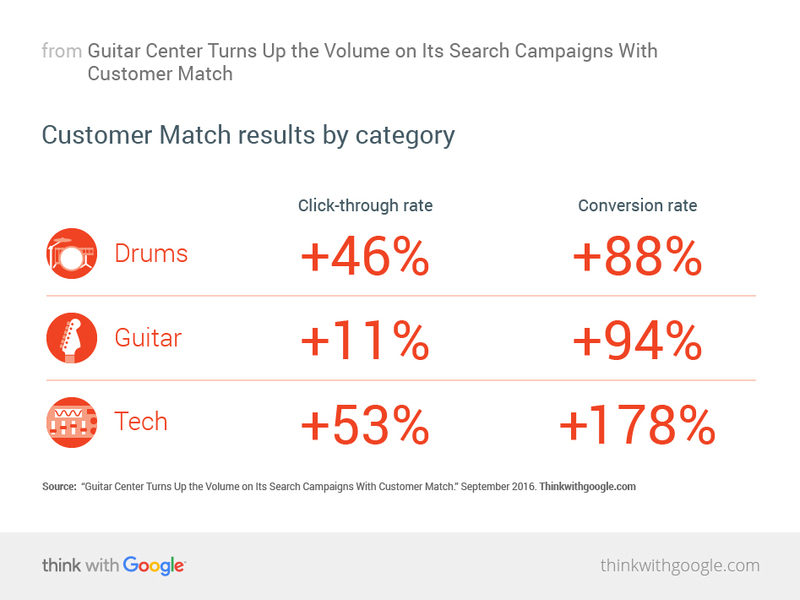 Because Customer Match has no expiration date on its customer email lists, Guitar Center used it to re-engage with dormant shoppers anytime they search for new products online. "Customer Match is an ideal way to deliver the right message to the right audiences, and it's helping us drive greater lifetime value from our customer base." For example, if customers who haven't been to guitarcenter.com in over a year search for "14-inch snare drum," Guitar Center is able to show an ad at the top of their search results inviting them back to buy that drum. By being there in these moments, Guitar Center can maintain a closer relationship with its customers and continue building brand loyalty. The five-month CM experiment led to a 60% higher CTR and 50% higher CVR compared to non-CM search traffic. CM also helped boost performance for product-specific categories, shining a spotlight on its ability to reach certain audiences. In future tests with CM, Guitar Center plans to change up its ad messaging based on audiences' purchase behavior. It also hopes to unlock cross-selling opportunities by running tests on instrument-specific audiences, allowing the brand to be there in the I-want-to-buy moments when a drummer may be looking for a new guitar.